More than 100 rescuers worked through the night to try to find the 13-year-old - a task made more difficult because, they say, it was too dangerous to send a searcher into the mazelike network of pipes beneath the city. To find Jesse, rescuers turned to technology, hoping sophisticated waterproof cameras. Sunday afternoon had been filled with soccer and volleyball and food, but at some point just before the Easter egg hunt, Jesse Hernandez and his cousins slipped away from their family's annual gathering to do some exploring on their own. What they found at the northern edge of Los Angeles's Griffith Park, after climbing a chain-link fence, was an abandoned maintenance shed, with a roof full of decaying wooden planks. While jumping on one, authorities say, Jesse fell through. He plunged 25 feet into a four-foot-wide drainage pipe, then was swept away. His cousins called out to him, the Los Angeles Times reported, but all they heard were the echoes of their own voices. For 12 hours, they found nothing. Then a sanitation crew put a camera into a maintenance hatch a mile from the park. The camera showed crews a feed of Jesse, "alive and talking," according to Los Angeles CW affiliate KTLA. Rescuers managed to pull him out, and one of them gave him a cellphone to call his family. They notified city authorities a little later. 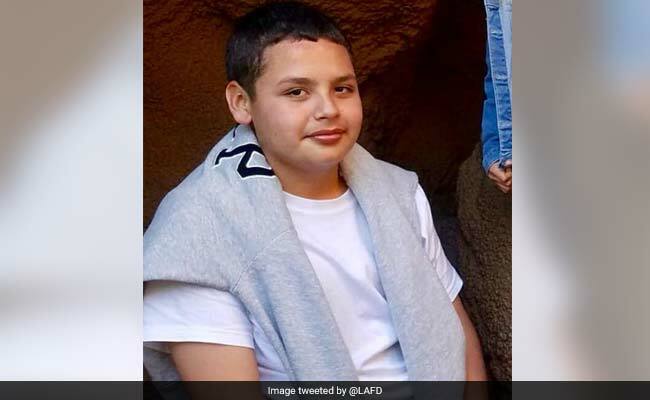 "It's with happy hearts that all Los Angeles City agencies are able to state that we have found Jesse Hernandez," Los Angeles Fire Department Capt. Erik Scott said at an early morning news conference Monday. "As you can imagine, we are overwhelmed with joy." Jesse was taken to a hospital, although it was unclear whether he was injured. For hours, authorities had been talking about how difficult it was to navigate the network of pipes. At some points, the water is two feet deep and moves at a 15-mph clip, ABC News reported. "That place is a maze," Los Angeles Police Sgt. Bruno La Hoz told the L.A. Times on Sunday. "We don't know where the drain pipe goes to." One camera crawled along the bottom of pipes and transmitted images to crews nearby. Another was attached to a boogie-board-like flotation device, the L.A. Times reported. It went 300 feet down one pipe. But neither caught sight of the boy. Rescuers fanned out to sites where the sewage system drains and searched chambers where Jesse may have gotten trapped. "All possible City resources are being utilized in the search for Jesse," the fire department said in a statement. Television news footage showed dozens of firefighters in climbing gear and helmets standing over a hole in the ground, the whole area brightened by floodlights. Others could be seen peering into the nearby Los Angeles River. Meanwhile, Jesse's family members and friends were keeping a vigil at the park. More than 20 remained late Sunday and were being comforted by city officials. "He's too young. It's just crazy. I still can't believe it," Dominique Barraza, 16, a family friend, said Sunday. "We called, sent text messages - it rings, but it goes to voice mail." Then, on Monday morning, Jesse called them.